The Rav served the communities of Chelsea and Sharon, Massachusetts for over forty years. B”H the “mystery list” is getting shorter, keep up the good work. Hi, Thank you for the site..I was looking through the site and found the cemetery, that my Great grandfather is buried in. His name was Pincus Smith (Pincus Kusnetz). He is buried in Chevera Chai Odem, in the Fuller Street Cemetery, Everett, Massachusetts . He is in “the new right” section. I would like to know if anyone has information about the shul he was from. He is listed as a pastor/cantor/rebbe on the shipping manifest. He went to Everett in 1912 and died there 5/1936. He lived at 95 Everett Street, Everett MA. If anyone know about the Landmanschft or the burial organization, that would be appreciated. I’m trying to build my history. Thank you all so much for making this site available. I actually found out that this Rabbi and Rabbi Israelite officiated the services for my great grandfather , Pincus Smith on 8/4/1936. My pieces are falling together. I hope to locate a Pincus Smith death notice or obituary for you in the newspaper microfilms at the Boston Public Library. If you are refereing to Rabbi Isaac Hochman. He was my Grandfather. As for sect my grandfather was orthodox only. He came from Poland/Pinsk. Hi! my grandfather was “Yosef Hochman”. He originated from Sonik, Poland. 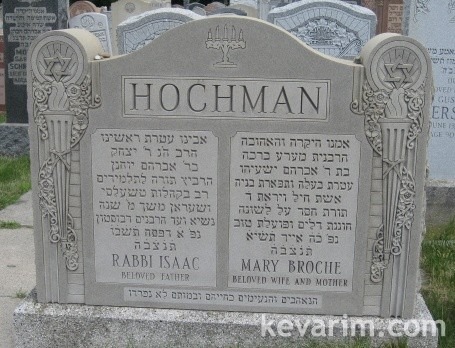 Can you perhaps give anymore info of this Rabbi Isaac Hochman? Thank you for responding, What Shul, Temple did R’ Hochman officiate in?…Why would he (and R’Israelite) Officiate over my G-G’s funneral? Did the people of the Shukles ask them to be R’?..I’m trying to figure out Why My G-G came to Everett Avenue and lived at 91 and 95 Everett Avenue in Chelsea for almost 30 years. Most of his children moved to NY, Brooklyn..Is it possible that they grouped by Russian, Polish place of origin, or sect of Orthodoxy? I Konw that My G-G is buried with All the Rabbi’s, at Fuller Street entrance .”NewRight” #6. He was Sexton and cantor of temple Zenith Zedek..Any information about your grandfather 1936 and before might be helpful..I would like to read..maybe a sfer 8/1936 or before..thank you j.